The adobe architecture, fire-roasted green chiles, and Native American art and culture of Santa Fe beckoned our family to New Mexico this past Thanksgiving. We immersed ourselves in the beauty of blue skies, purple mountains, and rolling clouds set against sun-drenched adobe structures and glimmering bronze sculptures. It was easy to fall in love with this special place. With plenty of friendly smiles, generously shared knowledge from locals, delicious food, and an atmosphere drenched in history and art, we soaked up as much Santa Fe culture as we could during our stay. The aroma of piñon pine firewood caught upon the breeze of the fresh, crisp air of fall often inspired us to just close our eyes and breathe deeply. Museums, shops and restaurants surround the Santa Fe Plaza, which allows for an entire day of walking and exploration. We especially enjoyed the Palace of the Governors and the New Mexico Museum of Art. The rich heritage of faith and religious ceremony is an important part of Santa Fe culture. We enjoyed experiencing the sacred interior architecture of the Cathedral Basilica of St. Francis of Assisi, the San Miguel Mission and Loretto Chapel, and learning about their history and traditions. A rich education in art history and art making can be obtained by meandering thoughtfully through the museums of Santa Fe. We developed a love for the work of Gustave Baumann when we wandered into a recreation of his printmaking studio at the Palace of the Governors. Learning about the history of the printmaking process from printmakers at Palace Press, the active print shop sharing the space, instilled an appreciation for note cards, books, maps and other printed products we encounter so often in daily life. 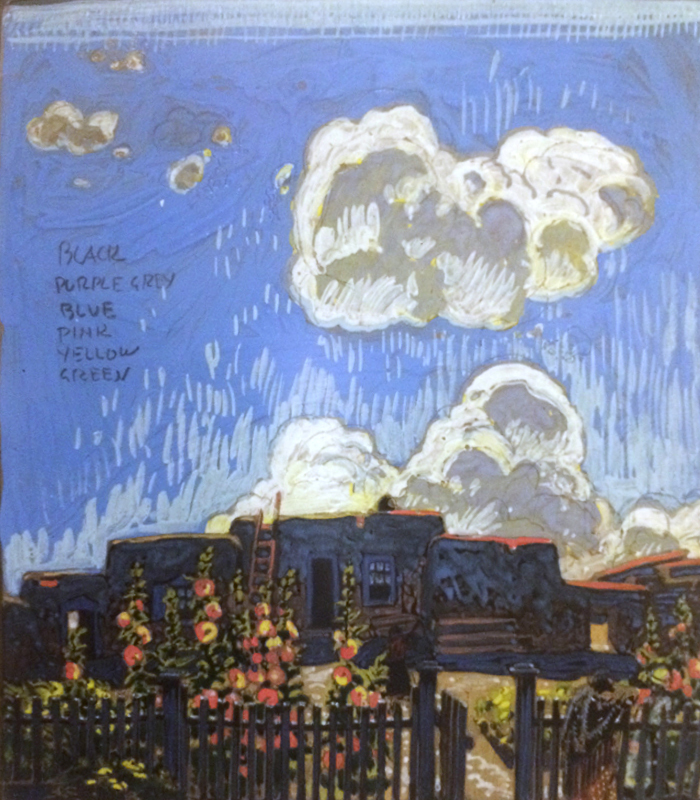 Gustave Baumann was an iconic figure in the Santa Fe art scene in the 1920s-1940s, creating beautiful prints that captured the gorgeous color, landscape and architecture of New Mexico. He was also a master marionette maker, who contributed to public performances that entertained many children and adults, and he established the popular tradition of the burning of Zozobra in Santa Fe. Another delightfully unexpected surprise was the folk art collection of designer Alexander Girard at the International Folk Art Museum. This whimsical collection features handmade art and crafts from cultures all over the world. Our faces were alight with smiles as we looked upon the elegantly curated scenes to find hidden gems of humor and beauty. Evenings were filled with music and amazing food. We discovered the artist Abby Posner and her band, Abby & the Myth, performing at Collected Works Bookstore. Abby is a gifted singer songwriter who plays folk-influenced acoustic music featuring her guitar and banjo.